Biography, Paintings of Belgian Symbolist Painter. One of the great modern artists of Belgium, the painter and printmaker James Ensor ranks among the top exponents of Symbolism. He was also an important forerunner of Expressionism and Surrealism. Trained at the Brussels Academy, he worked most of his life in his native coastal town of Ostend. His early paintings were in the tradition of northern naturalism, interiors in warm, muted tones, and townscapes. At about the age of 17, his alcoholic father died, and Ensor's palette lightened. He turned to fantastical subject matter in the manner of French and Belgian Symbolist painters. Other influences included the nightmarish images of Hieronymus Bosch (1450-1516), the colour effects of JMW Turner (1775-1851), and the skull iconography of Honore Daumier (180879). Ensor is often referred to as the 'painter of masks', as many of his subjects have a grotesque mask-like face, set in a carnival background, but in fact he created drawings, paintings and prints in a variety of different styles which makes it difficult to attach him to any one movement. His works are often satirical, crudely painted with bright expressive paint and brushwork. His best known work is Christ's Entry into Brussels (1888, Getty Museum, Los Angeles), probably the most famous of all religious paintings of the Symbolist school. Ensor was born in Ostend, Belgian. His parents owned a small market store where they sold bric-a-brac to tourists, like shells, carnival masks, fans, porcelain and toys. The grotesque carnival masks later employed by Ensor in his pictures were popular features of local processions on Shrove Tuesday. At the age of 15 he began his artistic training with two local artists, and between 1877 and 1880 studied at the Royal Academy of Fine Arts in Brussels, where one of his fellow students was Fernand Khnopff (1858-1921). He first exhibited in 1881 and thereafter returned to his parent's house where he remained until 1917. Ensor's first works were traditional and sombre in style, such as the Russian Music (1881), The Rower (1883, Koninklijk Museum, Antwerp) and The Drunkards (1883). In 1887 his palette noticeably brightened, a change which coincided with the death of his alcoholic father. In addition, his subject matter became slightly surreal, as he chose to paint carnivals, masks, skeletons and puppetry. He dressed his skeletons in suits and painted them in bright expressive colours. 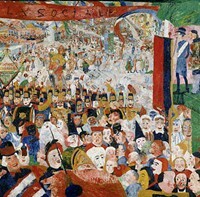 In 1883 Ensor's submissions to the Brussels Salon were rejected. The following year he joined the avant-garde group called Les Vingt. But even the new group rejected his single most important work: Christ's Entry into Brussels (1888). In fact the members were so offended by the style that they threatened to expel him. This only fuelled his sense of persecution and for the next few years he painted one incendiary canvas after another. Between 1888 and 1892, he focused especially on religious art, often depicting the torment of Christ. Whether Ensor was mentally unstable is not clear, but he seemed to have viewed civilization as scraping at the depths of depravity. His intensely pessimistic view of the world was expressed during this time in a series of paintings and etchings, exemplified by Christ's Entry into Brussels. The work depicts Christ entering a modern day Brussels in a Mardi Gras type parade. In response to French Pointillism, which was popular at the time, Ensor used palette knives, spatulas and both ends of his brushes to layer paint onto the canvas. Ensor's crowd are a frenzied mob, which almost threaten to trample the viewer, spilling out of the canvas. They are dehumanised, wearing masks, and clown-like faces in a crude, ugly way. Christ (in part a self-portrait of the artist) is at the centre of the chaos, making his way through the jeering crowd, to his crucifixion. In opposition to Christ is the social reformer Emile Littre, who is shown as a bishop holding a drum baton, leading the mindless crowd. The composition is thus an indictment of modern society. The painting hung in the artist's studio until it was eventually exhibited in 1929, becoming accepted finally as an important forerunner of 20th century Expressionism. In Dangerous Cooks (1896, Museum of Modern Art, New York), Ensor's head is served on a platter to a roomful of ravenous critics. This time, the artist portrays himself in the role of John the Baptist. As he approached 40, Ensor's best work was already behind him, although paradoxically this was also the time he started to receive public recognition. The Brussels Musee des Beaux-Arts bought a painting in 1895, his first museum sale. In 1898 he was granted an exhibit of drawings and etchings in Paris, which was followed the next year by the purchase of 100 etchings by the Albertina in Vienna. In 1903 he was singled out for honours by the King and later proclaimed Baron in 1929. However, Ensor produced little art of note in his last 50 years of life, perhaps because his fury and frustration at the world had subsided. His later pictures were often bland re-workings of his earlier ones. In the later years of his life he also wrote music and designed sets. He continued to paint until his death at the age of 89 in 1949. Ensor's works influenced the Dada movement and Surrealism, notably the work of Jean Dubuffet (1901-85). In 2009, the Museum of Modern Art (MoMA) in New York held a significant retrospective of his work. Today, paintings by James Ensor can be seen in several of the best art museums in the world, notably the Antwerp Museum of Fine Arts.  For more biographies of important modern symbolist artists, see: Famous Painters.